Private Charles Dean was born in Beeston in 1896 2, a son of George and Elizabeth (née Cox, formerly Morris) Dean3, part of a large family of three siblings (one of whom, Agnes, his sister, had died in 1909), seven step sisters from his mother's first marriage and a step-brother from his father's earlier marriage. By 1911, the family was living at 53 Wollaton Road, Beeston, with four of the children still at home. George Dean, a native of Staffordshire, worked as a coal miner while Charles had found work in the lace trade as a bobbin and carriage hand 4. It appears that his mother died towards the end of 19125. Having enlisted with the Sherwood Foresters in the early days of the war and, after a short period of initial training, Privated Dean was part of a contingent of 1st Battalion which embarked for France on 27th December 1914 6, arriving in the trenches in the middle of winter when conditions were appalling. On May 9th, his company took part in an offensive against heavily defended enemy lines, together with units of the East Lancashire Regiment. Shelling before the attack had been expected to have cleared the way but tragically, this was found not to have been effective and only a small gap had been made. Faced with strong enemy machine gun fire there were many casualties before the attack was called off, but not before more casualties were suffered as a result of enemy heavy artillery fire 7. Private Dean was one of the many killed in action during this offensive. 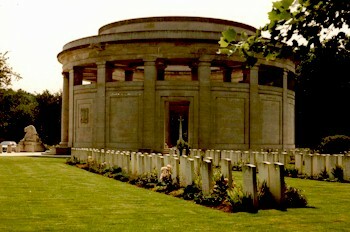 He has no known grave but is remembered on The Ploegsteert Memorial. Tragically, two others from Private Dean's family were also killed in the War. His brother, George Dean, serving with the Kings Own Yorkshire Light Infantry, was killed fifteen days later and a step-sister's husband, Albert Mee, died on 10 December 1917 while serving with the Royal Field & Royal Horse Artillery. The Ploegsteert Memorial 8 - stands in Berks Cemetery Extension, which is located 12.5 Kms south of Ypres, on the N365 leading from Ypres to Mesen (Messines), Ploegsteert and on to Armentieres. The memorial commemorates more than 11,000 servicemen of the United Kingdom and South African forces who died in this sector during the First World War and have no known grave. Most of those commemorated by the memorial did not die in major offensives, such as those which took place around Ypres to the north, or Loos to the south. Most were killed in the course of the day-to-day trench warfare which characterised this part of the line, or in small scale set engagements, usually carried out in support of the major attacks taking place elsewhere. 3Edith's mother, Elizabeth (b Beeston, c1857) married twice, firstly to George Morris at Beeston on 30 November 1874. After George's death in 1889, she married George Dean on 14 February 1891, also at Beeston. George also appears to have married previously. 4There were at least seven children from Elizabeth's marriage to George Morris and a son from George's first marriage. George and Elizabeth had at least four children, Agnes (about 1892), George (about 1893), Charles (1896) and Bertie (about 1900). In April 1911. George & Elizabeth are with those of the family still living at home, Charles & Bertie Dean and two of their step-sisters, Elizabeth and Clara Morris at 53 Wollaton Road, Beeston (1911 Census - Piece 20427 RD429 SD3 ED2 Schedule 152). 5Her death appears to be recorded in Basford Registration District Q4/1912, Ref 7b 209 - age 55. Significantly, Charles' backpay (£5 18s 6d) and War Gratuity (£3) were paid to his father (Army Register of Soldiers' Effects - Record 208727). 6Although his Service Record has not survived, his embarkation date is contained in the Service Medal & Award Rolls, listing those entitled to the 1914/15 Star. 7This account of offensive operations on 8th - 10th May 1915 is based on a report contained in the War Diary of 24 Infantry Brigade, 1st Battalion, Sherwood Foresters.